One of the saddest combat sports matters of 2014 was that Giorgio Petrosyan, the so-called Lamborghini of K-1, didn't compete a single time. He's not retired, he's not injured for life, he simply didn't fight. It was made worse by the fact that immediately before this hiatus, Petrosyan picked up his first loss in seven years, and his first by knockout. For a while, I was worried we had seen the last of The Doctor. Maybe he had gone the way of Marvin Hagler or Prince Naseem, retiring soon after the disappointment of his first loss. Maybe he was bored? He'd conquered the world in kickboxing and been at the top for some time. Certainly, it seems strange to think that the broken hand which Petrosyan reportedly suffered in his loss would keep him out of action for a whole year. But in four days time, on the 24th January, Giorgio Petrosyan will step back into the ring in Turin, against Turkey's Erkan Varol. Which means it's time to celebrate with a little Giorgio Petrosyan film study. The Glory lightweight division has been in a weird place for a while, with the belt being swapped around seemingly every event, but there are two men who absolutely stand out as the finest fighters in the world at that weight. The first is Petrosyan, the defensive master, and the second is Andy Ristie, the offensive tempest. Where Ristie starts fast, throws punches off one leg and switches between stances so often that he seemingly loses track of what he's doing at times, Petrosyan starts slowly, methodically, taking away his opponents' weapons and introducing his own over time. The two methods are so far removed from each other that they are completely incompatible. The dream is to build a fighter who is half Ristie, half Petrosyan, but it would simply be impossible. Petrosyan is called The Doctor because of his surgical precision, but frankly he could just as easily have been nicknamed The Bricklayer. Not only was he actually a brickie before he became the finest kickboxer of a generation, but it would amply describe the nature of his performances as he flattens out his opponent's offensive options and begins to build his own from the ground up—growing in combination length and power towards the end of the fight. Fights are often compared to debates or arguments, but a fist fight is no place to be focusing on the Socratic method. The beauty of Petrosyan's method is that rather than “if he does this, I'll do that”, Petrosyan works on the basis of “how can I stop him doing that?” And it's evolved to the point of “how can I stop him doing anything”? The secrets of Petrosyan's style are simple, and clearly visible, but often manage to sneak under the radar because they're not as obvious as the strikes that he throws. Let's examine them in Petrosyan's bout with current Glory lightweight champion, Robin Van Roosmalen. Obviously, Petrosyan is a southpaw, and it is immediately obvious that he does an excellent job of checking and controlling his opponent's lead hand. What Petrosyan does very well is to step his lead foot outside of his opponent's and pivot off. Here Petrosyan moves off of the ropes and places Albert Kraus on them instead. This can be used as both a defensive movement, to take him out of trouble, or as the preamble to an attacking technique. When Petrosyan pivots off his opponent is forced to turn to face him. You can't hit hard when turning, and you can't defend yourself all that well either, so Petrosyan will use this turn to land kicks to the rear leg, arm and body, or jabs when the opponent gets lazy. A pivot to set up a kick. A pivot to get off of the ropes, and a jab when Sato drops his lead hand. Against Robin van Roosmalen, the pivots are constant. Watch through the fight and see how many you can count. Petrosyan will use them to get off the ropes, to take the hyper-aggressive Van Roosmalen past him, and to set up kicks to the rear leg. A trademark of Petrosyan, and on full display in Benson Henderson versus Donald Cerrone the other night, kicks to the rear leg generally have great effect because the rear leg is typically less targeted and thus less conditioned. Petrosyan isn't afraid to go to a clinch when necessary either. I often say that the difference between a good striker and a great one is knowing that sometimes you need to grab a hold and start over. Clinching is shaking the etch-a-sketch clean on that exchange. Things not going your way? Think you could have done something better? Tie up and have another crack at it. But the most smothering facet of Petrosyan's game, and the most easily missed, is a great deal simpler than that. How do you make any technique ineffectual? Move out of range—either too far away or too close in. It's the only means of eliminating every strike in existence. You'll see guys like Lyoto Machida back track all fight and stay at an extended distance, but that's a great deal harder in a ring, where you're only ever a step and a half from the ropes. So what Petrosyan does is to push his opponent away from him. I told you it was simple. So why isn't everyone doing it? Well, physically pushing the opponent is illegal in boxing, and often the punches from the boxing arsenal are as far as the hands go in kickboxing. Robin van Roosmalen is a perfect example of this—all he does, in all of his fights, is get in close by putting on the earmuffs with his gloves, then throw combination punches into kicks. The simple act of pushing is an extremely under-appreciated art. George Foreman used to get criticized a lot for pushing in boxing, but when referees didn't penalize him it was an extremely easy way to move his man into the ropes—where Foreman would crush them. Norman Mailer recounts Muhammad Ali ranting about it to the press in Zaire before the Rumble in the Jungle, genuinely irate that no-one seemed to care about the foul except him. Even when you compare amateur wrestling to sumo wrestling, simple pushing (including the famous teppo palm striking of E. Honda fame) plays a far more important role when position in the area means winning or losing. Go off the mat in wrestling, there's a break and you resume (unless you left the mat in a neutral position). Hell, at the London Olympics, the judo was full of athletes standing on the edge of the mat and then simply stepping off if they conceded a good grip. Go out of the area in sumo and you lose, no excuses. When you're in a ring or a cage, and you're trying to time swings at each others heads, position matters, and Petrosyan abuses the power of pushing ruthlessly. When he lands a gut munching knee (his money strike), he will immediately push the opponent away so that they cannot respond. And there's a ton of different ways to do it too. You can do it with your gloves on the opponent—as above—or use the more traditional teep. Petrosyan uses his lead leg to push the opponent away throughout his fights, in fact the first twenty seconds of any Petrosyan fight is normally just Petrosyan getting his eye in as he teeps the opponent away a few times. And yet another way of accomplishing this same shove-away is to put your guard up, duck your head, and crash in, forearm-to-forearm with your opponent. You will see this one used all the time in professional boxing. During Tyson versus Holyfield it was a game changer (when Holyfield would make sure his head was protruding from his guard just enough for Tyson's face to smash onto it). Against James Toney, Roy Jones Jr. would throw a left hook, allow Toney to catch it on his guard, then sneak the same forearm across in front of Toney, shove Toney away, and throw an uppercut. Notice the bump away with the left forearm immediately after the left hook. It is only after Jones physically pushes Toney that the blows start landing. But it was in trying to come in, guard to guard with his chin down that Petrosyan gave Van Roosmalen his only effective moments in the fight. Each time Petro looked to duck in, RvR would throw an uppercut with bad intentions. But watching the fight, you'll notice Petrosyan adapt. He'll go to that less, and the next time he tries it (with his back to the ropes), he's well aware what Van Roosmalen is going to try, evades it, and capitalizes. Petrosyan might not be the most dangerous offensive fighter in the world, but his results against everyone not named Andy Ristie speak for themselves. He's fought eighty bouts, against men with every different skill set under the sun, and he's shut them all down the exact same way. The effects of correct distancing don't change. Doesn't matter if you're throwing a bog standard round kick, a jab, or a wheel kick, if you're too far away, too close, or being pushed backwards, it's not going to work. So why does Petrosyan's pushing and distancing game go so under appreciated? Because it's hard to see. He's not straining and hissing as fighters do when they punch or kick. He's just gently nudging off of his opponents all the time. It truly is almost constant. Here's a little clip from the Van Roosmalen fight where Petrosyan uses all four of the methods talked about within a second of each other. If we hadn't just talked about them, you'd probably skip over them like they meant nothing. It's only when you know how badly they're messing with Van Roosmalen's game that you start to value these seemingly meaningless shoves. Push on the gloves, teep, come in behind the forearms, pivot off. 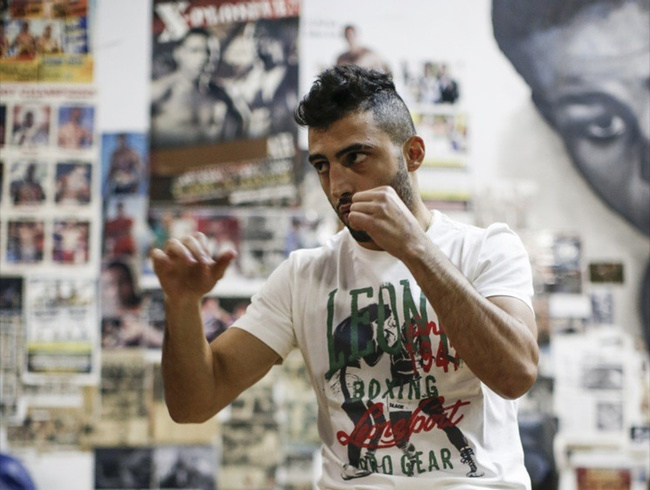 Petrosyan returns to action for the first time in over a year this Saturday. The man is a marvel of scientific fighting, but we are all victim to our mental demons. I eagerly anticipate the fight, and hope to see Petrosyan recover elite form that he maintained for so long. Jack Slack's Glory Breakdown: Is Artem Levin the Best Fighter on Earth?